Ravi Ragbir, executive director of the New Sanctuary Coalition, arrives for his annual check-in with Immigration and Customs Enforcement, March 9, 2017, in New York. The Trinidadian immigrant works with an interfaith network of congregations and activists seeking to protect New York's immigrant families from detention and deportation. He was convicted of wire fraud in 2001 and served his sentence but fears he will now be deported. City leaders said Ragbir passed out while in detention, which occurred during a routine check-in with U.S. Immigration and Customs Enforcement (ICE). Some supporters, who were already gathered outside the building for a scheduled prayer march and "vigil against deportation," confronted a departing ambulance, resulting in multiple arrests, including those of two city councilmen. 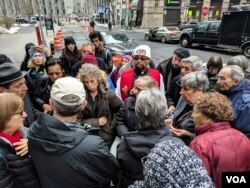 Others joined hands and prayed, led by the Reverend Donna Schaper, senior minister of Judson Memorial Church and co-founder of the New Sanctuary Coalition of NYC. "When ICE does things that are just beyond understanding, when they had other choices, they only make us stronger," Schaper told VOA. "They need to understand that." Ragbir, an immigrant from Trinidad, has faced the threat of deportation since he was convicted of wire fraud 16 years ago. Following removal proceedings in 2006, he spent nearly two years in immigration detention before his release in February 2008, a period during which he became a rising voice for the country's immigrant community. He is now executive director of the New Sanctuary Coalition. Until his detention, Ragbir had an administrative stay of removal in place, which suspends an order of removal. His attorneys said they had already filed a lawsuit. "We came into the check-in with the hope that they would allow him to continue checking in as he has for many years, complying with all the rules that have been required of him," said Alina Das, one of Ragbir's attorneys who was present with him in the meeting, along with Ragbir's wife. "Obviously we are incredibly disappointed and, frankly, outraged by this decision," Das told VOA. "We continue to pursue our options — the legal challenges — to see that he will hopefully be freed soon and back with his wife and with the community that loves him." At the time this report was published, ICE had not responded to VOA's request for comment regarding Ragbir's arrest. Ragbir's arrest followed that of Jean Montrevil, an immigrant activist from Haiti who was taken into custody last week near his Far Rockaway, New York, home, and just one day after The Associated Press reported a wave of ICE raids at convenience stores across the country. Barbara Young, a Barbadian-American immigrant and organizer with the National Domestic Workers Alliance, was present for Thursday's vigil in lower Manhattan. As she spoke of Ragbir and the nationwide workplace raids, tears rolled down beneath her sunglasses. "It is crippling for the immigrant community," Young said. "If you are here in the country and you decide to go find a job, and they're targeting your workplace, you're not a criminal." Following a group prayer, Schaper, who works closely with Ragbir, remained resilient, asserting the strength of her surrounding community. "We have so many leaders, in addition to Ravi, whom Ravi has built up over these many, many years," she said. "We're not even one bit afraid." More protests were scheduled for Thursday evening in front of the detention center where Ragbir was being held.